The story became caught in a tug of war between the perspective of Murray who—the failure of The Razor’s Edge a decade before still resonating—wanted Groundhog Day to be more philosophical, and Ramis’s view that it needed to be funnier. 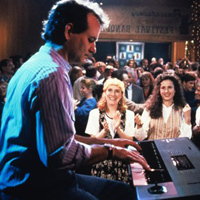 Of course Groundhog Day was an instant classic because both were right, and because each prevailed over the other at just the right time in just the right measure. A throwback to comedies that had head, heart and laughs, and regarded them as not all mutually exclusive, this is the crucial entry in Murray’s filmography, the portal to later performances that were on the tipping point of comedy and drama, and the moment when Murray overcame the limits of the all-pervasive irony that so defined his persona for ‘70s and ‘80s audiences. It’s also when two notions, previously difficult to imagine, became fully credible: Murray as a romantic lead, and Sonny and Cher’s “I Got You, Babe” as the soundtrack of purgatory. The Essential Movie Library #66: Faster, Pussycat! Kill! Kill! November’s Best Showings of Classic Movies in L.A.